In this review we are going to have a look at the “3 Week Millionaire” binary options scam by Sean Wallace. Shouldn’t there be a different name on this check? Wallace says in his video that he has a binary options trading system that can make you up to $50.000 per day. He wants you to become a beta tester that will use his system for free. He says that it is guaranteed that you will make money, if not, he will pay you $21.000 from his own pocket. Unfortunately it is a lie. There are no guarantees, no contact information, no terms and conditions. The testimonials are fake, videos are made with paid actors, bank account statements are fake. But there is more. He shows that he makes exactly $10.000 with every binary options trade on different assets. But this is a nonsense, because no binary options broker has the same return ratio on every asset, it often varies between 60 and 85 %. So real profits would vary depending on the asset. 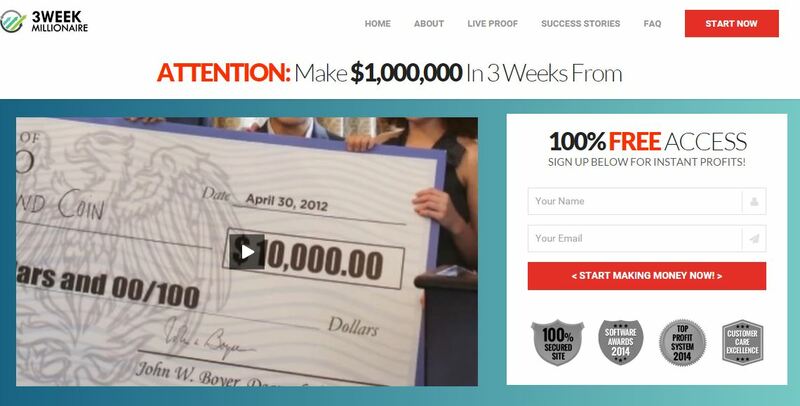 There are a lot fake awards on the 3 Week Millionaire web site. It supposedly won the “Top profit system award” in 2014. Why would such a proven system need beta testers a year later? Fake counter. You can see a counter on the page that soon falls to 1 spot left. But reload the page and there will be 10 again. The profits from other traders are supposedly verified by a third party. But guess who is that third party? Tradeverify.net, which in fact is a verified scam designed to support binary options scams. Try to leave or close the 3 Week Millionaire page. You will be urged to stay and join by a pop-up window. Isn’t it strange that somebody is begging you to be allowed to supposedly make you money? Don’t join the 3 Week Millionaire system. If you do, you will first have to open a binary options account and deposit money. The system will then trade your account and lose your money. It is not your aim, is it? We keep repeating it, you can make money with binary options, but you first have to learn trading, build your own system and trade yourself. Where were you a week ago? Yesterday was my first day, and what was supposed to have been 5 10,250.00 paydays. It had me on 5 trades for 7 hours each. They miraculously posted $19.00 profit each. Yet this morning a loss on a currency trade gone bad and of course after I had raised my investment from $25 to $50. Still has two trades active to the end of a 7 hour parking spot. These are supposed to be 60 second trades not 7 hour trades. The broker never posted my match bonus and in an email stated that a fraction of a match would take place. Never did! I have the feeling that this is a bait and switch sympathizing scam setup by the broker BINARY BOOK. The one red flag I had ignored and will never do again is He did the review for 3wm. Didn’t he think that anyone would put it together? He needs to put his direct contact info as in his CELL PHONE INFO ON THERE. HE NEEDS TO FOLLOW THRU. ALSO, IS THERE ANYTHING THAT THE SEC CAN DO? LIKE PUT HIM UNDER A JAIL CELL!